Almost 700 volunteers served as greeters for the 19th Annual Hardee’s Rise & Shine for Heat, a fundraiser for Heat Up St. Louis. Hundreds purchased sausage biscuits and egg biscuits for $1. With the results from some of the 55 area Hardee’s reporting in, along with online donations and pledges, the bi-state area utility assistance and advocacy charity has raised more than $570,000, 40 percent more than the winter of 2018, which was about $406,000. Heatupstlouis.org funds are used to reconnect or stop disconnections of homes using natural gas, propane, home heating oil and electric as primary heating sources. Heatupstlouis.org expresses the seriousness of avoiding the unsafe method of using space heaters as primary heating sources and encourages needy households, seniors and the physically disabled to get help by logging onto Heatupstlouis.org. This year Heatupstlouis.org worked with Hardee’s to also have canister collections two weeks prior to the annual Rise & Shine for Heat Benefit. Hardee's also gave area organizations and companies a chance to pre-order large quantities of sausage and egg biscuits prior to the benefit. 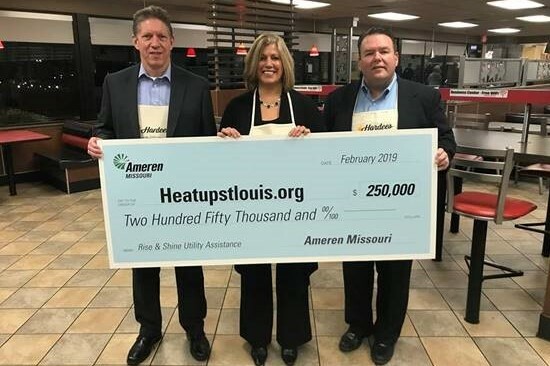 Since its inception 19 years ago, Heatupstlouis.org has impacted the lives of more than 525,000 people in about 34 Missouri and Illinois counties and the City of St. Louis. The charity operates by an all-volunteer board of directors with 100 percent of public donations, including Rise & Shine funds, going strictly toward servicing the needy in Missouri and Illinois. The board underwrites all administrative costs to keep the charity operating. Published on February 27, 2019 by Ryan Sinovic.